Please Note: There's an error in this pattern if you purchased it before 09/25/2017. Click here for the correction. Modern elegance meets classic style. 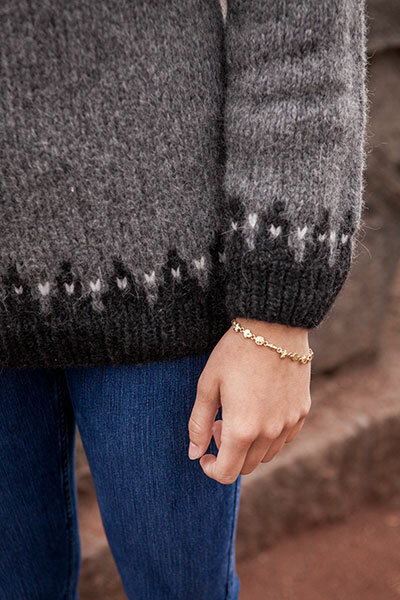 The simple beauty and harmonious color gradations of traditional Icelandic yoke get an update with a chic monochrome palette and sleek contemporary silhouette. Combined with the soft and airy Wonderfluff, this unisex design will be a surprisingly light and warm addition to any wardrobe. 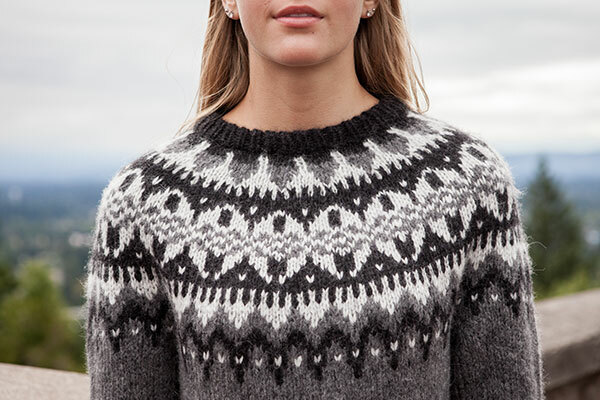 The Eldfell Pullover is worked in the round from the bottom. 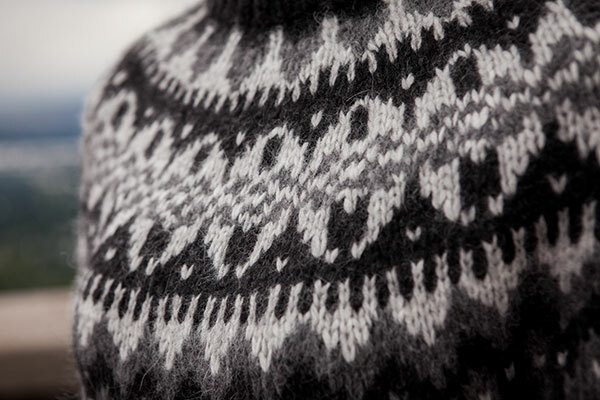 Colorwork at the hem and cuffs echo the stranded yoke. 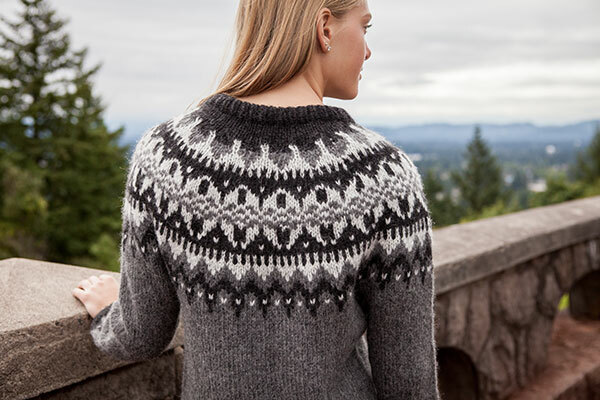 Includes no body shaping other than a few short rows at the back neckline for a more comfortable fit. Oops! There's an error in this pattern if you purchased it before 09/25/2017. Click here for the correction. I just finished knitting this sweater, using the Wonderfluff yarn it is written for. I LOVE this pattern and the sweater turned out beautifully. I posted a picture for my friends and they were all amazed at the colourwork. The pattern itself is well-written and easy to read, along with the charts. The only challenges I had, which were minor, was being able to distinguish the colours in the chart, when the chart is printed out. 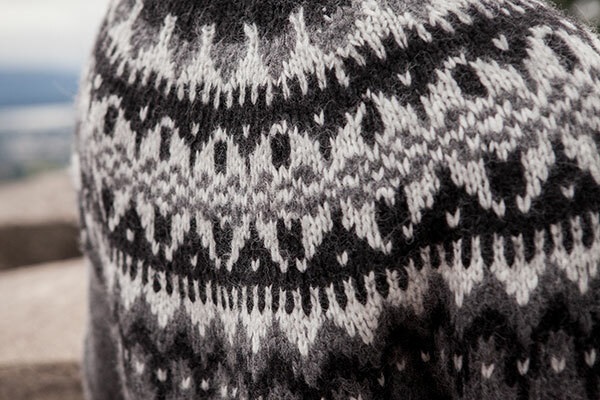 The grey scale is too close and symbols would be more useful to show "no stitch". On screen, it is fine. I also found the sleeves on the 33" size to be too big and noticed there is no difference with the next larger size. I'm guessing this is because the stitches are needed for yoke but it makes the sleeves needlessly large. Overall, an easy to read and enjoyable pattern that knits up beautifully in the Wonderfluff yarn. I'll be knitting this one up again!